“Originally produced as a small pamphlet by the Neopantheist Society in 1979, this is a fully revised and much expanded edition”. Indeed a small volume but full of interesting material. 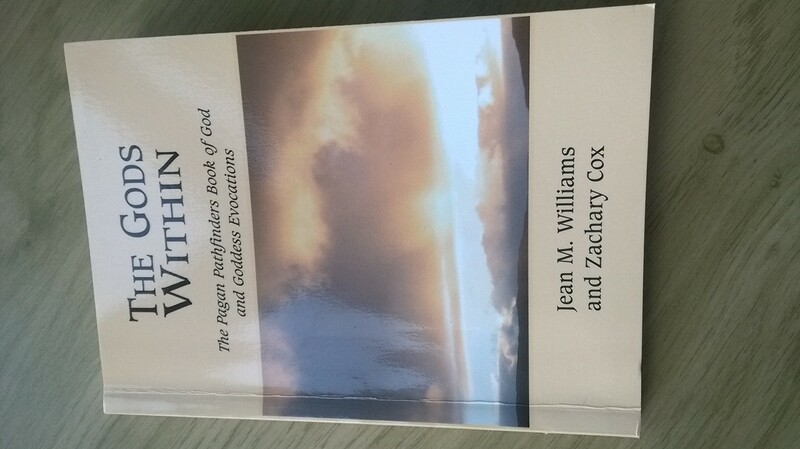 It is also pocket history of the “Pagan Pathfinders”, the experiential group Jean & Zach founded in 1975. Still going strong PP introduced many well-known witches and pagans of today to the world of paganism. Jean & Zach are also well known for their involvement in the Pagan Federation – since the 1990’s. 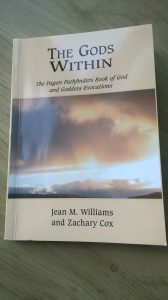 “The Gods Within” is divided into two major sections: the how and why of using evocations. The word evocation is specifically used instead of invocation, “ .. traditionally, the occult use of the word evocation has referred to the magical practice of summoning a spirit or demon into manifestation in a triangle set outside a magical circle and to establish command over it, commonly regarded as a rather dangerous operation. This not what we do in PP nor is it the purpose of these evocations. The term is used in a psychological rather than magical sense; the aim is to evoke feelings, images and ideas from within the psyche of the individual”. After an elaborate introduction, we move on to the “Gods and Goddesses”. Divided into three sets – Graeco-Roman, Egyptian and Celtic – 15 different gods and goddesses are reviewed. From Aphrodite to Dionysus, from Pan to the Morrigan, each god or goddess is described from mythological attributions followed by an evocation. The evocations follow a certain order and style and together they create a body of recognisable ritual texts. This is a wonderful addition to any witches’ Book of Shadows.